The flood gates of Windows 8 are slowly opening and the latest bit of news to trickle out of Microsoft’s freshly pressed “Building Windows 8” blog is a brief look at some improved file management features. Although the accompanying video looks innocent enough, it does subtly reveal a few other tidbits about a potential Aero facelift. The most obvious of which, as WinRumors has also noted, is the solid-shaded Windows flag in place of the Start button. Some suggests this button will launch the new tile-based Start experience which is reasonable considering the similarities to the Start button within the touch experience. On closer inspection, the taskbar itself seems to blend completely to the background without obvious borders or shading. Although the video resolution could be playing tricks, it’s practical the new taskbar simply floats on top of the wallpaper with only a button surrounding active applications for a more minimalistic look. Next, the Window chrome seems to have been reduced to just a drop shadow. The glass edge encompassing the application seems to have been remove entirely, leaving what seems to be a drop shadow underneath the rectangular client area. I really hope this turns out to be the case since the chrome-less aesthetics on Mac OS X is much more appealing for modern applications. Last but not least, Windows Explorer also displays a “syncing” status in the status bar. The icon and terminology “Always available” suggests this is an extension of the “Offline files” feature that already exists in Windows 7 and earlier, however it’s prominence in the status bar confirms that syncing will be a much more common task in Windows 8. The “drop shadow” effect seems to be rather the edge of the monitor. Errr, no. There’s a black line underneath and to the left side of the white window area. Man, i really, really, really, hope the Windows Experiance team takes the Metro design language to heart and actually apply the principles and values of it well into Windows 8. I hope they don’t. Windows 7 looked good as it was. I don’t want change for the sake of change and some fashion fad which the same people demanding it will be wanting changed gain in 5 years time. I don’t think they should adopt fashion trends for the sake of fashion either, but if they have ideas of how it can look better, I hope they don’t just ignore that and purposely not work on any changes, just because of some conservative idea that “it looks fine how it is”. Some of the design principles in Metro are also in modern, non-Microsoft desktop apps; using different font sizes, for instance, presents information better than having everything in the same tiny 10pt just for the sake of it. For example, in Google Chrome, the address bar having larger text makes the design of the window seem more clear. I think the Windows interface should ‘get with it’ because this is a good change. I also would expect them to change small things just so that the classic desktop UI experience look stylistically consistent with the Immersive UI experience, and it doesn’t feel like going into the desktop you’re entering a “ghetto” interface that’s deprecated. What about the new min,max and exit buttons?? Yeah, those look fugly – Microsoft should just leave things as they were – the Windows 7 windows were a piece of beauty, so why change perfection? Windows aero has always been ugly to me. I am glad its Windows is taking a new UI direction. Metro is far cleaner and far easier to use and understand. Thats great moving forward. I feel those icons are on another layer. Some sort of post production to hide or pretend to be the taskbar. The last icon for folder seems weird & fake. that folder icon is the standard Windows Explorer taskbar icon from Windows 7. nothing fake there. it might be video playing trick, like LZ stated. Nevertheless that icon does not seem complete from my perspective. The lower part is slightly gone. Even in focus state, my Win7 explorer icon (large) is complete. I’m not convinced that the window isn’t fully maximised. I think those artefacts are a reflection of what’s in the room. The bright bit on the left hand side (about a third down from the top) carries on across the screen in a straight line almost to the dog’s chin. The dark bit in the second picture also seems to match up with a slightly darker line across the navigation pane. I really think they give WAY too much attention to all those small pure-interface looks, rather than put their effort into important functional things, more customization options etc. They keep changing the same things over and over again with every version (window buttons, window frames, shadows… oh God, countless unimportant stuff) – conveniently drawing focus away from the real thing that would make user experience really better. Why the heck they would need countless anonymous feedbacks and decades just to put essential features and functions into the interface?! .. features that are long ago proven as very usable and needed. At the same time removing features and customizability, pretending to “not distract users” ?! Come on. Start button – whether with an orb or with plain glyph… Who cares after all?! They also should have removed the ‘Start’ text looong ago. I have no words! Well, maybe for all 100 dollars, they spend 1 at user interface. It’s not like the development of Windows goes slower because of interface changes, it’s more an addition that will make more people convinced the new Windows is new. And those countless anonymous feedback systems do work. Just because you like something, or prefer something doesn’t mean all of us do. Those feedback systems count everything what we do and shows stats for Microsoft in where to put focus. Remember the new superbar? It’s because of that feedback. I like the new copy system. I just preferred it wouldn’t copy two or more files at the same time. Copying goes alot faster using a qeue. Followed with an up and down arrow for priorities, and I was pleased. But then again, they mentioned it’s not a replacement for teracopy. On the contrary, I think you’ll find that most of the readers of this website would agree that Microsoft gives far too little attention to ‘small pure-interface looks’: that’s why Long had to start the Community Taskforce project. Microsoft has a lot of employees and can fart and chew gum at the same time. Long really should start a Community Taskforce project based on Windows 8. Or start one after Windows 8 has finished and we can complain about the UX quirks and hope they will be fixed during the Windows 9 development. Agreed. Microsoft has always had a problem with fit-and-finish. Taking steps in this direcion would be a good thing. Unfortunately we have idiot fanbois who want things to change for no other reason than for the sake of it and because “Apple did it”. As for the border-less window: I doubt that they get rid of the borders. It seems that the Explorer window is maximized but there is still a border on the left edge of the screen. Maybe this is where you can slide apps back into the view with the mouse? Because the mouse pointer isn’t able the go beyond the edge of the screen to activate that gesture. My point was all about being way too retarded to add essential productivity features to the OS and that they don’t need so much feedback to ring their bells that something is important to have. They removed the “Start” text from the Start button just in Vista?! Come on. THAT’s retarded. I don’t like anything in particular – I was talking about constant irrelevant changes to the UI nobody really needs. It’s for all those teenagers who like the flashy shiny looks and do nothing but just staring at the interface or playing games. Also it seems the feedback is either from retarded feedback’ers or MS wouldnt have listened to valuable opinions because every serious user I know is complaining of stupid lacks of something, customizability, at the same time the interface is constantly meddled with, changing irrelevant things with no value. The new copy system is Ok, should we have waited for 30 years to see it built-in? I have dozens of other features to suggest (sure they have been suggested millions of times I guess), and most are minor, but maybe I’ll see them in 2060 if at all. Why ever change anything? Why doesn’t Microsoft just bring back freakin Windows 98? Meanwhile, companies like Apple who spit and polish their UI’s can continue to absolutely dominate in both mindshare and marketshare for their respective focus areas. I wouldn’t put much faith into the small details of the video or images. I think this is more of a mock-up to demonstrate the new file management features. 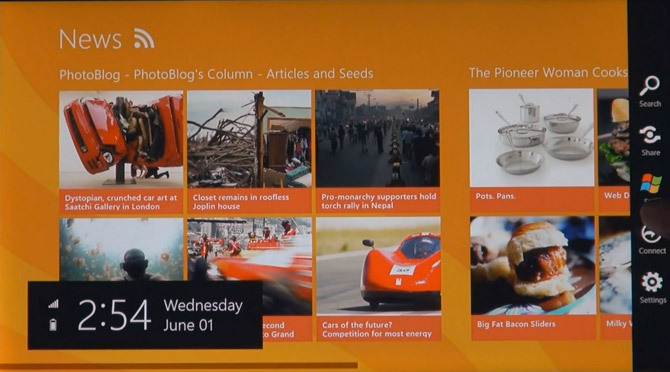 Microsoft often prototypes UI by using flash. It’s almost beta. This is not a prototype. It is possible that the Desktop interface shown is not yet sporting a final Aero re-design. I am personally hoping for something a bit more Metro to work alongside the Immersive UI. The Start button was the first thing I noticed! It’s kind of hard what to make of the padding on the left side of that window. It looks like the window is maximized, but that padding looks rather wide. At the moment, this seems like Microsoft’s perfect idea of a practical joke. I do however, have my fingers crossed and putting all my faith in Microsoft to create a Windows 8 that truly blows Windows 7 many millions of miles out of the water. Aero and Metro mixed together in one dialog don’t look good. Either apply Metro to the whole system or Aero. Which obviously means keep both styles so users will use whichever they want to use. Will Microsoft keep Aero once Metro takes more prominence? Personally I prefer Aero over the flat solid colors in Metro. It’s like using Paint’s Fill with Color to create all graphics and they don’t want to put any effort into creating polished, 3D, gradient/shading-using graphics. Maybe Metro will only be active in the so called Aero Lite theme and (I hope) not to see its ugliness when using Aero. Maybe the Start button is also going to change depending on what it’s going to activate: the Live tiles screen or the “old menu”. There’s no rule that Metro must have one solid color. There can be very subtle gradients that may not seem to change unless you really care to look closer. Background panoramas for many apps in WP7 are not a solid color, but actual photos. The Zune desktop software has several gradients of white. You also seem to be complaining about their lack of effort at making Aero look cooler, but you don’t seem to be offering any useful proposal as to how you would like to see Aero in Win 8. Plus you seem to act as if Microsoft was dropping the Aero that many people like in Windows 7 like a hot potato. We don’t know for sure, but it seems like Metro stuff could be disabled if users wanted to. Plus even if they did do what you don’t want them to do, I’m sure there will be 3rd party solutions to give you what you want. It’s Microsoft’s OS after all. How to make Aero look cooler is the job of design professionals. We don’t know if Microsoft is going to force the Metro look on everything or give users choice. There is nothing wrong with expressing that I don’t prefer Metro but like Aero because Metro most often uses solid color backgrounds and single color icons. No need to attack someone. Agree – metro, squareness, and “tiles” are fugly. I’d say that window is maximized, at least, the maximize/restore button looks like it’s showing the restore icon. Anyone else notice that the right hand side of the taskbar (the clock / system tray area) is being purposely hidden? In the first scene the guy is standing right in front of the area, and I thought coincidence. However in the screencap shot that area is being deliberately obscured by a subtle blue box. Something there that Microsoft doesn’t want us to see yet? I noticed that, too. Leaked screenshots have a small user account picture in between the clock and the ‘show desktop’ button, as well as an updated language bar (in between the notification area and clock). There’s lots of room for improvement though. What do you think Long? Windows8TaskForce perhaps? But there’s one more thing… where is the scrollbar? If Microsoft drop scrollbars for the sole reason that it’s the Apple fashion to do so, then I’m ditching Windows and moving to KDE. I have to disagree on the idea of borderless windows. The border helps you easily distinguish one window from another, and because the glass is transparent you don’t lose pixels by doing so. This just reminds me of being a pathetic cave-in to the Apple fanboy hipsters in the tech media (only fanboys out of fashion and no other practical reason) – all style over substance and functionality. Ha ha your comments are pathetic. Metro UI is the most innovative UI design of the last 20 years. Ubuntu and XP are epic fails. Why do I think that this looks exactly like windows 7?? I mean why is microsoft so afraid of just throwing off that interface with a fresh new metro-isnpired one that works with the mouse and keyboard not a touch screen cz what all what we have is windows 7.5 for desktop and windows 8 for tablets? !